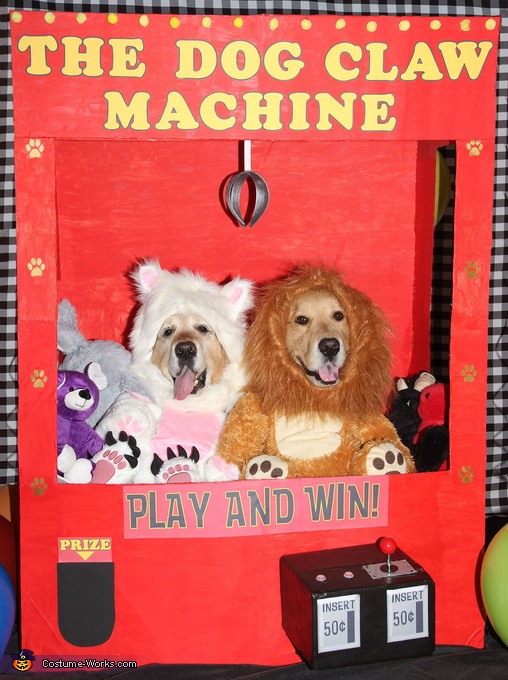 Phoenix and Gryphon are cuddly stuffed animals inside a giant claw machine, like the ones you see at arcades. Phoenix is a stuffed polar bear and Gryphon is a stuffed lion. This was entirely home-made. The box for the claw was made from foamboard. We cut out pieces to form the box and painted them red. We cut out holes in the sides, and glued it all together. Then we decorated it to look like a claw machine. We added a box, which we painted black, and glued on a little joystick, buttons, and coin slots. We printed letters to spell out the name of the Claw Machine and glued it on, We also added pawprint stickers, yellow pom poms, and other little decorations. The dogs were actually sitting inside this giant box, and we used toddler costumes for their bodies, which were stuffed and adjusted to fit the dogs. These were then propped onto a secret shelf inside the box, to create the illusion. The claw itself was made from two headbands painted silver and glued in a criss cross fashion, and then hung from the top of the box. We’re sure anyone would want to win these adorable “stuffed” animals!